Letters from Russia by Ouspensky. 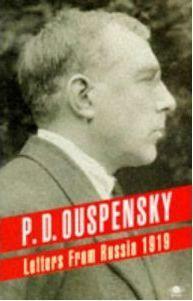 From 1907 until 1913 P. D. Ouspensky wrote for a Russian newspaper, mostly on foreign affairs. At the same time he was working on various books based on the idea that our consciousness is an incomplete state not far removed from sleep, and also that our three-dimensional view of the universe is inadequate and incomplete. Hoping that answers to some of the questions he had posed might have been found by more ancient civilizations he made an extensive tour of Egypt, Ceylon and India. On his return Ouspensky learnt that Russia was at war. In 1919 P. D. Ouspensky somehow found a way to send a series of articles to the New Age, which, under the skillful editorship of A. R. Orage, was the leading literary, artistic and cultural weekly paper published in England. These five articles appeared in six installments as ‘Letters from Russia’. These texts are not spiritual teachings, but articles serving to give you a better understanding of who he was. From 1907 until 1913 Ouspensky wrote for a Russian newspaper. This is the collection of five of his most important pieces of writings.